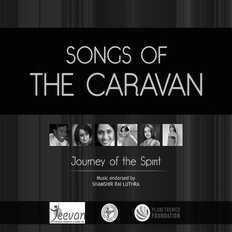 Songs Of The Caravan | OK Listen! Akkai Padamshaili is 29 years old. A human rights activist working with Sangama, Bangalore,she has been fighting for the right of the gender minority community for the past two decades. She feels that things have begun to alter in the traditional Indian mindset and notes that there seems to be both subtle and appreciable changes taking place in terms of how the issue is now looked at. Widely travelled and acknowledged, she has recorded Lakshmi Stuti- “Bhagyada Lakshmi Baramma for the album.” A Kannada prayer dedicated to the goddess of wealth Lakshmi. She wanted to learn Carnatic Vocal as a child, when she was turned away by her teacher as he felt that her presence made other disciples comfortable. She has found a ‘Guru’ in Smt- Chitra Chidambaram(Banglore) who is fulfilling her dream to learn music. Amitava Sarkar is associated with trans activism and capacity building initiatives since 2000. Her current affiliation is Solidarity and Action Against The HIV Infection in India (SAATHII),based.at.Kolkatta. She had made two films on trans issues which have been appreciated at many seminars and conferences at national and international platforms. Being a science graduate, she also completed a post graduate course on social welfare and a basic course on counselling. She learnt Rabindra Nath Tagore’s songs for more than 7 years and got a diploma in first class. Amitava’s dream project is to start an initiative for transgender/Hijra population towards providing them all kinds of services without any complication at various parts of India. For the album she has sung ‘Jodi tor’ a bangla classic by Rabindra Nath tagore…inspiring everyone to walk alone and own their fears. She currently lives in Calcutta. Bharat or Ankur Patil has a Diploma in Vocal music from Maharaja Sayajirao University, Mumbai, Mahashtra. She is currently staying in Vadodra, Gujrat and has sung in Gujrati for the album. Here is what She has to say about herself : “The song selected is a self-composed song which reflects myself and my life’s journey. It’s a journey form darkness towards light. The words “Hu Pankhi banine udu…..” shows a passion and a flaming desire to get liberated, to challenge the societal structure and the belief that only heterosexuality is the norm of the society. I chose this song because till date I have lived a life that society has expected from me. I want to feel liberated and want to live openly. Finally after years of struggle, I have successfully discovered my new path. The song is the breakthrough from the conservative norms of society. Recording was a wonderful and a very special experience. I for the first time felt confident on my own skills. I also felt that it requires a great amount of patience and skills to be a wonderful singer. I think music is a feeling and it can only be felt. If music had gender, I don’t think it would have been this advanced as it is today!! So I don’t feel shy to say that it’s because it doesn’t fall in either categories; it still has soul… After perusing Vishard course in Singing, I want to start a small school for singing for those who are financially not very settled and provide them training in singing at free of cost. Today at 40, I reflect back on my life… I realize that I had to lose too much to gain what I have gained today. My struggle to get my identity recognized has been a painful. After lots of criticisms and being prejudiced; I have been successful to get it accepted. Today I am proud of myself and I thank my self-reflections for always pushing me to this levels and challenging me to break my own records and as it is rightly said, “Records are meant to be broken”. Hansa - Hansa is 34. Originally from Rajasthan, she has been staying in Mumbai for a long time with her family, though she has only studied till 7th std. she wants to make it big in life and is looking for opportunities. With no formal training in music, she sings among friends and family only. Recording for the album was her first experience and she felt really great about it. “I used to sing in school, that’s my only training.’’ She says, her family runs a safety pin manufacturing business. For the album she has sung a Rajasthani folk song that talks about relationship between a daughter in law and the brother of her husband. Kalki Subramaniam is a 29 years old transwoman from Tamilnadu and is a double post graduate in media and international relations. She is a transgender rights activist and is the founder of transpeople's organization called ‘Sahodari Foundation’. She has acted in films, has made numerous short documentary flms, she also trains transpeople in to become citizen journalists. She is a prolific writer on trans issues. She is also a business women having recently launched her business line. She believes the word ‘courage’ to be central to her existence, “Courage to think new, do newer things, if anything that breaks your heart, walk away from it. That’s why I have been able to make my parents proud. My song is also about walking away from pain and misery. It asks the listener to be free and liberated.” She concludes. For the album she has sung a Marathi folk song depicting a state of a women as she awaits for her beloved to come back home. Growing up was not comfortable, I was rejected both by my family friends but I stuck to what I wanted. I completed two years of Music training from Different places. I started singing at small platforms but the real break came in annual Shumang Leela competition organised by Manipur State Kala. I got continuously best female vocalist from 2003 to 2007 for the said annual competition. I chose this song for the album because I like the theme of this song. In future I want to give better platform for transpeople to perform at regional and national stage. Madhurima - Madhurima is from AndhraPradesh and has sung a song in telgu for the album. She has sung a selfwritten and composed Lakshmi stuti worshipping her in her 8 forms. Madhurima is teacher by profession. She also has a degree in music. Rani - Rani is from Delhi. She has sung a folk song from U.P Rani is also known as Rahul, she lives in Delhi, she is 19 years old and she has been singing since she was 9 years old, She has studied till 8th std. Rani has had no formal training in music. She sings at functions like marriages, childbirths, festivals prasing hindu deities, etc. For the album she has sung the song ‘ Yashoda maiya’ This is a folk song of U.P sung by women to celebrate the birth of a male child. She runs a professional singing choir by the name of ‘Rahul Deewana and party’. Being a transgender has been a smooth ride for her since early childhood and she was accepted among friends and family with ease. “I am a very proud earning member of my family.” She adds.